What's better than a touchscreen on a smartphone? Two of them of course! And that's exactly what the newly launched YotaPhone 2 offers. We first saw this device at MWC 2015 back in February, but it's taken the Russian firm over eight months to get the handset out the door. On the front of this unique device is a relatively standard 5-inch, full HD AMOLED display, but turn it over and you'll find an always-on 4.7-inch E-Ink screen, both of which are protected by Gorilla Glass 3. Both are full touchscreens, which is an advancement over the original Yotaphone which only had a touch sensitive strip at the base of its E-Ink display, and you can even access the full Android interface on the low power, black and white rear. In terms of the other features the Yotaphone 2 comes with a 2.2GHz Snapdragon 800 processor, 2GB of RAM, 32GB internal storage, 4G connectivity, 8MP rear camera and 2.1MP front snapper. The Snapdragon 800 processor is a little old, having been superseded by the 801 and 805 chips from Qualcomm, and there's no microSD slot to build on the internal space provided. Yota Devices claims that in reading mode on the E-Ink display you'll be good for up to five days on a single, while the special YotaEngery mode promises up to 8.5 hours of operation from the last 15% of battery. The Yotaphone 2 goes on sale in over 20 countries including the UK on December 4 priced at £555 (€699, around $870, AU$1020), arriving in Asia Pacific and China during early Q1 2015, and then the US, Canada and Latin America later in the quarter. 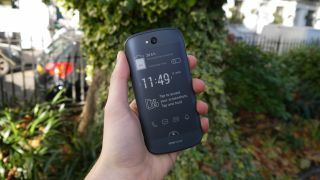 Check out our extensive hands on: Yotaphone 2 review, which will be updated to a full review very soon.